Fran Hodgkins is the author of numerous children’s books, including Andre the Famous Harbor Seal and How People Learned to Fly. She lives in Rockport, Maine. Karel Hayes is the best-selling illustrator of the “Visitors” series, which includes The Winter Visitors, The Summer Visitors, The Christmas Visitors, and the forthcoming The Autumn Visitors (Sept. 2015). She lives in Center Harbor, New Hampshire. 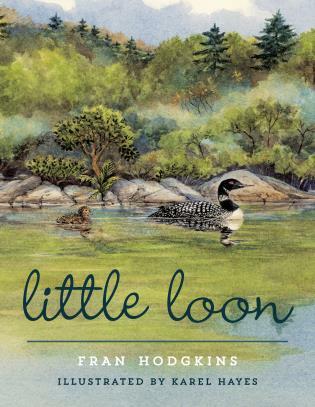 Little Loon is the story about a loon and her first summer on the lake, and also teaches loon facts. . . .I liked Little Loon because I have seen loons at our cottage in Canada. I learned some facts about loons, like the color of the eggs, that baby loons float, and that both parents take care of the babies. I liked the illustrations, they are colorful, but I wish there was more detail of the loon’s feathers. My favorite fact is that red eyes might help them see better underwater.